We couldn't have this film without the comics. Mr. Ian Bates is taking spotlight to educate us on the legacy of Ant-Man and the Wasp in the comics. 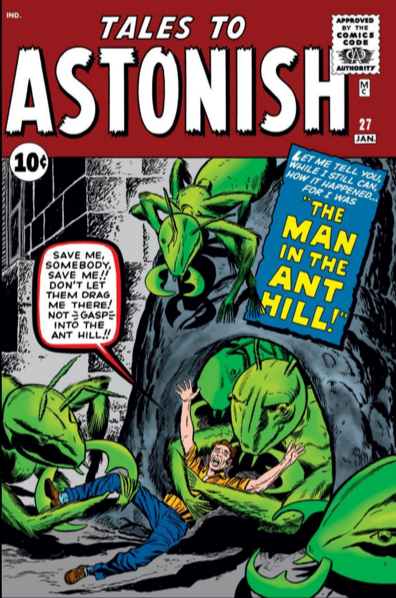 Ant-Man boldly made his debut in 1962's Tales to Astonish #27. This version of the Ant-Man was Hank Pym. Just a year later, we are introduced to The Wasp in Tales to Astonish #44. Fun fact, The Wasp in this incarnation is Janet Van Dyne and she was responsible for naming the Avengers. Ian does recommend the new limited series from Mark Waid and Marvel, you can click here to check it out. Ant-Man and The Wasp serves a first for Marvel in showcasing (and co-headlining) a female superhero .Evangeline Lilly makes her debut in this film as Hope Van Dyne's alter-ego, The Wasp. How does the film handle the character though? We're jumping in to discuss how the film handles partnerships and female superheroes. Ant-Man and the Wasp is expanding the Marvel Cinematic Universe in the same vein of 2014's Guardians of the Galaxy opening up the cosmic side of the MCU. This film jumps deep in the quantum realm but how does it handle the science behind it? We're shrinking down into the quantum realm to discuss the science behind the film. If you listened to our last episode, June 2018 Round-Up, we've been hitting hard on the importance of friends and family. This Ant-Man sequel does place family in the spotlight. While this film is filled with action and humor, at its' heart, it stresses the importance of family and community. When you're struggling with suicide or depression, family and community can really be the healing point to know your value and not feel so alone or depressed anymore. We do not own any rights to Ant-Man and the Wasp or Rick & Morty. Their images and sound clips are property of Disney, Marvel & Adult Swim. We do not claim any rights. Music by Logan McElroy & Shawn Davis. We do not claim any rights to The Flash, The X-Files or Man of Steel. They are property of Fox, DC & WB.